This recent piece is a Memorial Wall Hanging. I was commissioned to build this for a friend from college days. She in turn had a friend who's teenage son died quite unexpectedly. The young man loved the saxaphone. 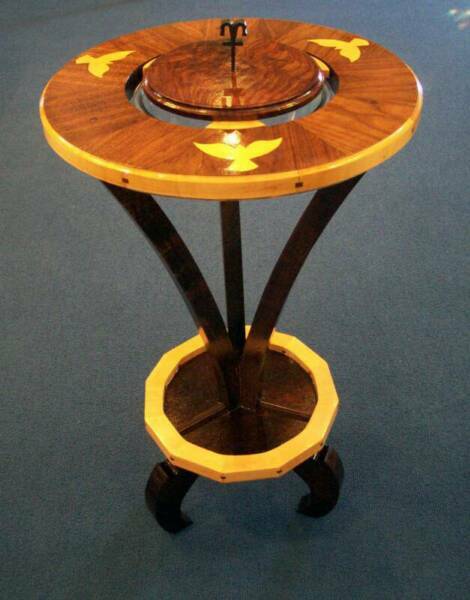 Made from Walnut, Maple and Sapele. This piece is a Case on Stand and was designed to hold this antique Bible for the First Congregational Church of Ann Arbor. You'll see this piece on several pages of my website as it falls under several categories including a table and liturgical furniture. This is Version II of a Case on Stand and was designed to hold an antique Bible for the Levy Baptist Church in Little Rock, Arkansas. made from Mahogany with gilded moldings and architectural features, and Shop made Brass hardware and details. 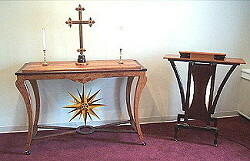 Here are two pieces built for liturgical use at Glacier Hill Retirement Center of Ann Arbor. with a finish in dye stain and Shellac. The pieces are in an Art Deco Style. 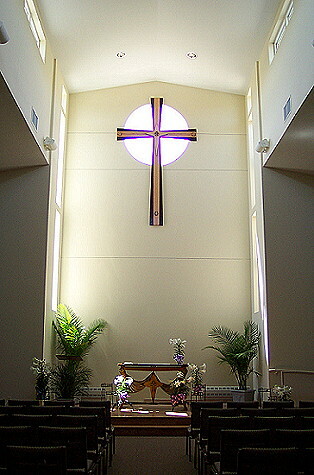 Cross for Washtenaw Christian Academy.